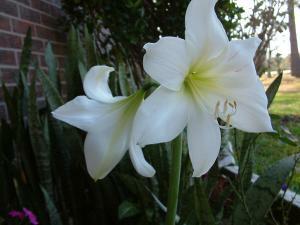 Amaryllis (Hippeastrum spp.) 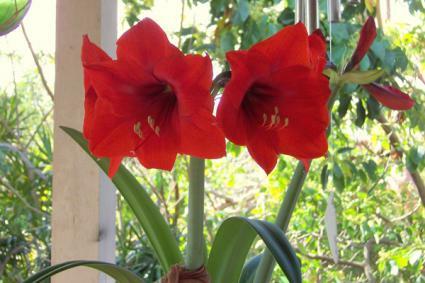 is a tropical bulb that is often grown indoors and given as a gift on special occasions, like Valentine's Day. The enormous flower stalks emerging from a tiny pot on the dining room table are priceless as a living flower arrangement. With tubular flowers up to 10 inches long in a dizzying array of colors, amaryllis is a show-stopping bulb. The flowers emerge on two-foot stalks in late winter, followed by 16-inch strap-shaped leaves. Amaryllis has very low water and nitrogen requirements; an excess of either often leads to poor flowering and rotten bulbs. It grows well in sun or part shade though filtered light is its sweet spot. 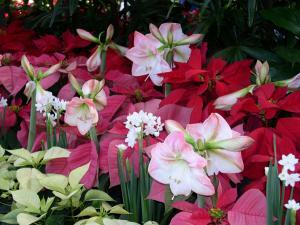 Amaryllis is from tropical and subtropical regions and can only be grown outdoors year-round in USDA zones 9 to 11. It can also be grown year round indoors, or it can be planted outside during the warmer months and brought indoors for the winter. It is useful massed in a perennial border, as an under-planting for large trees, or it can be forced to provide color indoors in winter. 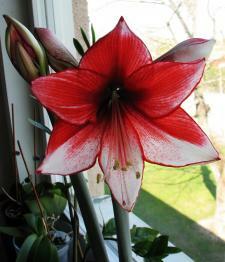 Amaryllis is a poisonous plant, primarily the bulb, potentially causing diarrhea, vomiting, and other symptoms. However, the toxic compounds occur in a low concentrations, so large quantities must be consumed to pose a serious health threat. It also problematic for cats and dogs. Growing methods vary based on whether you'll be planting it in a pot or outdoors in the ground. 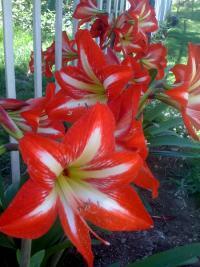 Amaryllis flowers best with its roots constricted in a small amount of soil. Thus, the size of the pot should only be one inch larger in diameter than the bulb. Plant it with ordinary potting soil, so that the top third of the bulb is above the soil line. Water periodically to induce blooming, but always let the soil dry out completely between waterings. The flowers will last longer if they are kept away from the sun, but after the blossoms fade, put it in a sunny window to encourage the leaves to grow and produce energy for next year's flower display. Replace the potting soil each winter to prevent the nutrients from becoming exhausted. Beds for amaryllis should be loosened to a depth of at least six inches and enriched with compost. Plant the bulbs 12 to 16 inches apart with the neck of the bulb sticking above the soil. Water them lightly only if the weather is hot and dry. Cut the flower stalks down as they fade and remove the leaves in fall. Cover the bulbs with several inches of mulch in winter to prevent them from freezing. They can be grown outdoors as far north as zone 8 with a heavy layer of mulch. Fertilize in early spring with a high-phosphorus, low-nitrogen fertilizer to promote abundant flowering. Pests and disease are rarely a problem with amaryllis though it's not always easy to coax the perfect blooms from the bulbs. If the blossoms are smaller than advertised, it may be because the bulb was not full size. All else being equal, the biggest bulbs produce the biggest flowers. If the bulb does not flower at all, but only produces leaves, it probably has insufficient nutrients and should be fertilized with a product intended for bulbs, which are commonly available at any garden center. If the bulb rots, it is likely being over-watered. It's important to concentrate water on the soil, rather than bulb, as it is extremely susceptible to rotting if water gets in between its outer layers. Amaryllis is one of the most widely available bulbs at local nurseries. These are a few of the most beautiful cultivars to look out for, all of which are hardy in USDA zones 9-11. 'Fantastica' is red with white stripes down the center of each petal. 'Picotee' is white with pink edges on the petals. 'Lady Jane' has double rose-colored blossoms. Amaryllis has a few specific growing requirements, but overall it is surprisingly easy to grow, given how spectacular it is. With little more than water and light, it puts on a breath-taking flower display for weeks on end.